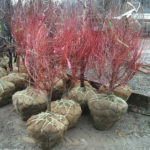 We have an excellent selection of Japanese Maples, both weeping and upright, starting in late March when the trees come in. Able to add year round interest, it seems as if no property is complete with out one. 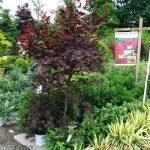 We carry small sizes of both types starting at 3 gallon all the way up to a few specimen Bloodgood Japanese Maples at 12’+. Our prices are excellent compared to other local nurseries. Hana Matoi is an interesting cultivar that provides many colors within its leaves. The leaves are mostly green or purple with streaks of pink, purple, creamy variegation. 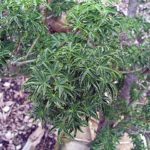 It has an overall weeping mounding habit and is an excellent cultivar to add to the landscape for interesting leaf color and nice overall form. Orangeola Japanese Maple will have colorful foliage starting off orange changing to green in summer and through shades of purple to bright orange/ red in the fall. Orangeola has an excellent form and is a nice addition to the landscape. Viridis Japanese Maple has green foliage that that changes to yellow and orange colors in the fall. Nice mounding weeping habit. Garnet Japanese Maple is an excellent cultivar that has thread-leaf foliage and graceful rounding branching pattern. Red foliage holds its red color into fall before losing its leaves for winter. Use as a specimen or accent tree in your landscape. Inaba Shidare Japanese Maple has nice weeping branches that form an overall rounded habit. It has good foliage color with shades of red/purple. It has a very bright red fall color before losing its leaves for winter. Excellent accent tree to add to your landscape. Tamukeyama Japanese Maple is an excellent cultivar that forms a weeping mound of threadleaf foliage.It has red bark/stems with dark purple to reddish colored foliage. The foliage will change to a vibrant red in fall before losing its leaves for winter, this provides a very nice fall color. A superb accent tree for the landscape. Bloodgood Japanese maple gets its name from its blood red foliage in Spring, Summer, and Fall. Adaptable to light shade. Deer resistant. Orange Dream Japanese Maple is an upright tree with spreading horizontal branching pattern. Its foliage is orange changing to bright green and then a golden orange in the fall. A nice small tree to add to the landscape. Emperor One Japanese Maple has dark reddish black bark that pairs nicely with its dark red foliage. It has a good fall color when leaves turn bright red. Loses its leaves in winter. Emperor One is good to use in the landscape to add red color. Twombly’s Red Sentinel Japanese Maple is an upright columnar shaped cultivar. It had deep maroon to burgundy foliage color. Foliage emerges bright red then matures to burgundy then changes to bright red again in the fall. Loses leaves in winter. Its stems will turn bright red in winter adding seasonal color. A great tree to add to narrow spaces. The Coral Bark Japanese Maple is best known for its coral-red bark but also displays excellent Spring and Fall colors of lime green, yellows, and oranges. This is truly a tree for all seasons. Lion’s Head Japanese Maple has interesting textured leaves for a Japanese Maple. Its leaves are curled inwards and have green color. The leaves change to red/orange colors in the fall before losing leaves for winter. A unique Japanese Maple to add to your landscape.